The Wireless Building Management System (WBMS) and WDLS (Wireless Datalogger System) control units represent the range of Wireless coordinators dedicated to data integration into Building Automation and Domotic systems and local and remote monitoring of physical quantities. These controllers handle the monitoring activity in full autonomy, recording the acquired magnitude of the internal memory and allowing local / remote access and establishing the access point for the WSN network by external automation systems. Local access with personal computers and DCET management software connected to the USB port of the controller. Remote access with personal computers, DCET management software connected to the USB port of the controller and GSM point-to-point connection. Remote access with personal computer web browser and internet service center. Local access to automation systems through analog interface. In this case, the control unit is equipped with a number of analog outputs (typically 0-10V) that can be associated with the measurement channels of the individual probes. Analog outputs repeat in real time the measured value of the probe. Modular control units are available that allow the expansion of the number of outputs up to 40 and non-modular control units with a fixed number of outputs. Appropriate relay outputs also indicate any system abnormalities or exceeded thresholds set by the user. Local access to automation systems through digital interface. 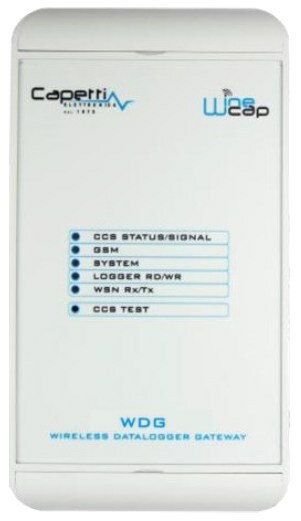 Through the communication ports provided by the control unit (depending on the USB, RS232, RS485 models) and the Modbus RTU protocol it is possible to query the quantities acquired by the wireless monitoring system by PLC, protocol gateway or personal Computers with dedicated software. Typically, the digital interface is more efficient and economical than the analog one on medium / large systems, while the analog one is convenient for connecting to automation systems without bus communication capabilities. For single-use applications that are usually based on real-time measurements rather than historical measurements, WINECAP offers probe-free probes (WSS range) cheaper than Datalogger probes (WSD range).